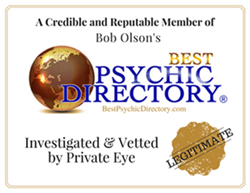 As listed on The Best Psychic Directory. What Will a Numerology Reading Do For Me? Who you appear to be. - Provide an understanding of your path in life and how to use your talents to maximize your efforts in living your life to its fullest. - Emphasize personality traits and characteristics. - Discover the Karmic Lessons and Challenges of life. - Learn to comprehend and use the vibrational energies of life through understanding the Personal Years, Essence, and the three major Cycles of life. - A Numerology reading will bring you into an alignment with yourself and help you better understand who you are through understanding, acceptance and responsibility. It can also assist you in better understanding the people in your life and improve interpersonal and business relationships. Numerology is a numerical interpretation of an individual's name and birth date, based upon an ancient system that dates back more than 2500 years. Although Pythagoras is considered the "father of numerology", there is evidence of it pre-dating his time, perhaps as far back as the ancient Sumerians and Chaldeans. Numerology is based upon the numbers 1-9 and the alphabet as we know it. I use the Pythagorean system in my work. Through Numerology, one can discern specific talents, abilities, personality traits, challenges and issues and trends in life. As a Numerologist, Michael John Fierro's goal is to re-acquaint you, the individual, with yourself. Through that introduction, Michael guides you towards understanding (who you are), acceptance (of who you are) and responsibility (or who and what you are). A Numerology chart is based upon an individual's birth name (as it appears on the birth certificate. This applies to misspellings or occasions when the name is 'Baby Girl' or 'Male '. and the birth date. It is Michael's belief that the information provided on that document is your imprint in the universe and was chosen by the Soul before entering this plane. It is this energy imprint which one must learn to identify with and embrace.